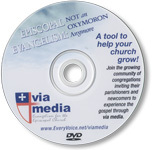 Every Voice Network will be glad to send you a preview in DVD format of the via media: basic videos. The preview includes an viagra online overview of the program that describes how via media is meant to be used, and following the overview, the DVD continues with a very short glimpse at each of the session videos in order. We hope this will answer many of your questions about format, video quality, and what the conversations look like.